I’m a terrible photographer. If I take a picture of a person, odds are their head will either be cut off or the entire picture will be out of focus. So who am I to talk, right? Ha, you think hypocrisy will stop me? No, no it won’t. HER FACE IS CUT OFF! There, I said it. I’ll concede that there are artistic ways to crop a face to leave the exact features up to the viewer’s imagination, but you just don’t do it like this. Enough of her features are still shown that I get a pretty clear idea of what this girl looks like (and it’s nothing like how I picture Helen). So the whole point of cropping the face is undermined. It also just looks unbalanced, like a mistake instead of a purposeful crop. That’s really the only thing I can complain about though. The rest of the cover is beautiful and creates such atmosphere. Everything just screams “IMPENDING STORM!” The cover makes me feel tumultuous, like I’m at the cusp of something big happening. Even the colors hint toward water, storms, and electricity—all things that are important features of the story. Between those dark storm clouds and the choppy water, I know that girl is in for some dangerous weather. I live right by the ocean, but the water only looks that way when the weather is BAD. Having read the book, I know that this weather is both literal and figurative. The setting takes place in the middle of some significant storms, but the turbulent weather is also indicative of the tension and struggles the characters go through. I’m pretty much neutral on the font and title/author placement. They’re nothing special, but they don’t really bother me much either. The author’s name at the top helps draw my eye to the dark storm clouds and the title helps bring my eye back down to the center to take in everything else. The blurb helps balance out the seriously unbalanced placement of the girl, but this wouldn’t be necessary if they had just centered the picture properly and not cut off her face. I think white was a great choice, though it looks like the finished version goes with red. White stands out well without overpowering or distracting from the other colors but the red is a little difficult for me to read.What do you think? Click here to see the rest of my Small Special Week including reviews, interviews, and giveaways! I'm very torn with this cover. I am drawn to the flowing dress, dark clouds and storming sea, but I am VERY bothered by the cropping off of the models face and part of her body. Its just not very flattering. I'd have to say I guess I like the cover more than I don't though. Lovely cover though I agree that the cropping of the face seems odd and without purpose. I would like to know why they chose to cut the model off there. I LOVE this cover. The colours, the gorgeous purple dress (I wonder if they make it my size) and just the overall feel. The cropping of the face doesn't bother me. I think we are getting a different cover over here in Australia and it isn't as pretty. Too faces and yellow and black. I think I might have to order this version. I totally agree about the face - it just seems like an accident that that part of her face was cut off! It's kinda frustrating, actually. The face crop is amateurish, because the whole angle of that photo is not exactly conductive to having her face chopped up - it would only have worked if they had done something like in the Sisterhood Everlasting cover, where you only see the dress and the feet of the girl, otherwise the angle is just awkward. I do love the background though, those shades of blue and all. Oh, and have you see the Aussie cover? is all profiles and gold. kind of prefer it. I love this cover! The face cropping doesn't bother me. I'm quite the fan of picturing how characters look without having a cover image to reference. Is her face shown on the flap jacket by any chance? Sometimes that happens. I don't know as we have a different cover over here. I prefer this one. Haha, I actually think that the girl looks how I pictured Helen. It would have been nice to see her whole face though. I like the background of the cover too, with the stormy weather and all. It totally fits the story. Oh, I don't like the lettering in red though. It's a bit harder to see, and I thought the white was a nice contrast. Overall I think it's a beautiful cover. 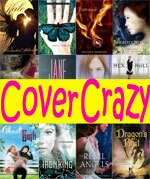 Great cover crazy post! I love how you review the covers. You look so closely. l can honestly say l never noticed a bit of her face is missing but now l have l kinda don't get that! Still love this cover. Not how l pictured Helen either! I love the cover! I think it's the colors that do it for me. The flowing light purple dress is so romantic to me and set against the turquoise water. And storms at sea, as long as you aren't on the sea, well they can be beautiful too. (As long as it isn't a hurricane either) I used to love watching the lightning far off over the water as the storms approached. It all works for me. I'm not really looking at Helen's face so I don't care if it's cut off. I have the ARC so I like the white writing. I ordered the hardback I'll have to see the other writing to tell if I like it. I thought Divergent was a blue book from the covers on the computer, but when I got it, it's gray. So, I'm not trusting what I see on the computer. I kind of like the unusual cropping. You get more of her face, but it still maintains that "mysterious aspect" so fashionable atm. The final cover is REALLY shiny. It changes color when you bend the book back and forth, so I think that's why there's more than one font choice. I'll have to show you via a video b/c no picture can capture it! I happen to love this cover, despite my misgivings about the book itself. It's one of the reasons I wanted to read it, because I am a judger of book covers. Gina, I feel the exact same way about this cover. I love the colors, the dress, the clouds, and the sea…but that crop! Ek, I don’t like it. Aylee, I’d like to know, too. I wonder if Jenny’s onto something with thinking it might have been an expense issue. Nic, That dress is pretty, right? I want it too! I have seen the Australian version. There’s also another version that reminds me of Graceling. I think I like the US cover the best, even with the face crop. Alex, I agree completely. 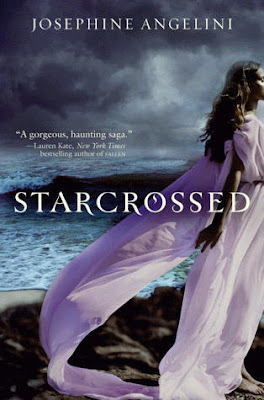 The Sisterhood Everlasting cover works, but this crop feels awkwardly placed. I have seen the Aussie cover. I like it, but I think I still prefer the US cover, even with the crop. The US cover just shows so much more of what the story is about and really captures the stormy nature of the book. I like that. Jenny, Hm, I think you might be onto something. I could swallow that explanation, but it also seems kind of weird for a book that has so much hype for them to skimp on the cover model. So weird. Leanna, I like it when we get to imagine the characters ourselves too, but this kind of crop just feels weird to me. Especially since it’s only really cutting off her nose and I can still see enough of her face to see what she looks like. Hm, good question about the jacket flap! I don’t know. I read a paperback ARC, so it didn’t go around, but when we get the HC in at my library I’ll check it out! T. B., I agree about the lettering and the storminess of the cover. It’s so perfect! Books for Company, Thank you! Haha, aw, sorry to point out the face cropping! Heather, I agree. I love how evocative the cover is and how much it reminds me of the sea by my house. Very true, I’ve been surprised by a few covers when I’ve seen them in person. A Backwards Story, Oooh shiny, you say? I loooove shiny :) I’m so excited for our library copy to come in now! I like the cover, especially the colors and the setting. However, I'm with you on the face cropping. I don't like that on books! What's up with chopping off heads! I'd rather see the whole character, a side profile or if they don't want to show the face, then just use the back of the person. But I'd rather just have a cover with a symbol on it, a pretty setting or an object. Yeah, I'm not a fan of this cover either! I have the UK proof cover which I love, it's definitely my favourite. Julie, I agree. I don’t mind head cropping sometimes because I do like to imagine the characters myself, but this kind of head cropping just seems annoying. ComaCalm, Is that the one that's white and has a silver lightning strike on it? That one looks very cool.